"We have seen the mere distinction of colour made in the most enlightened period of time, a ground of the most oppressive dominion ever exercised by man over man." Open to the public on June 4, 2017, to a crowd of over 800 people, The Mere Distinction of Colour is the culmination of years of archaeological and historical research, with the goal of telling a more complete, holistic American story. 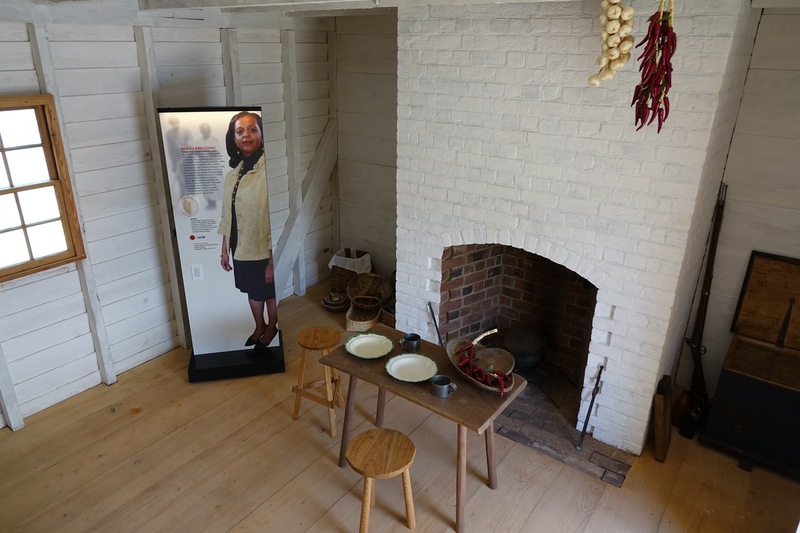 The exhibition spans the cellars of the James and Dolley Madison's plantation home and the South Yard of the property, where the domestic and field slaves lived and worked. 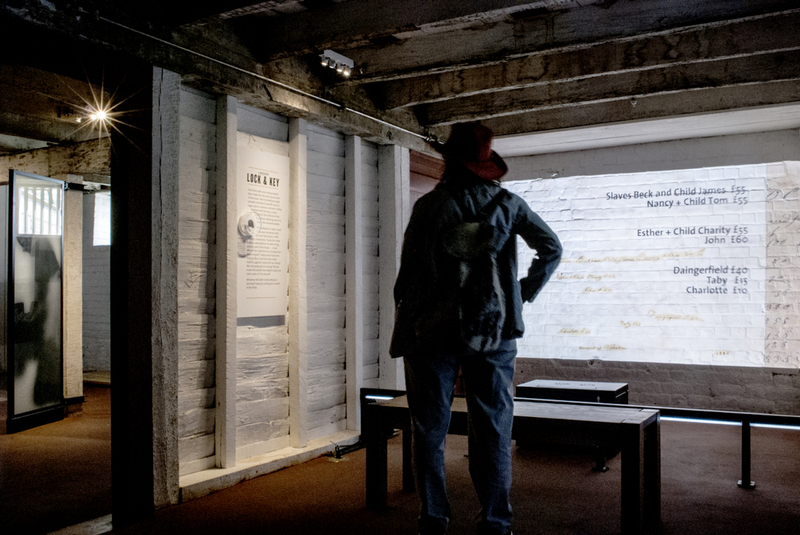 Provocative, interactive, and emotional, The Mere Distinction of Colour offers visitors the unique opportunity to hear the stories of those enslaved at Montpelier told by their living descendants, and explore how the legacy of slavery impacts today’s conversations about race, identity, and human rights. 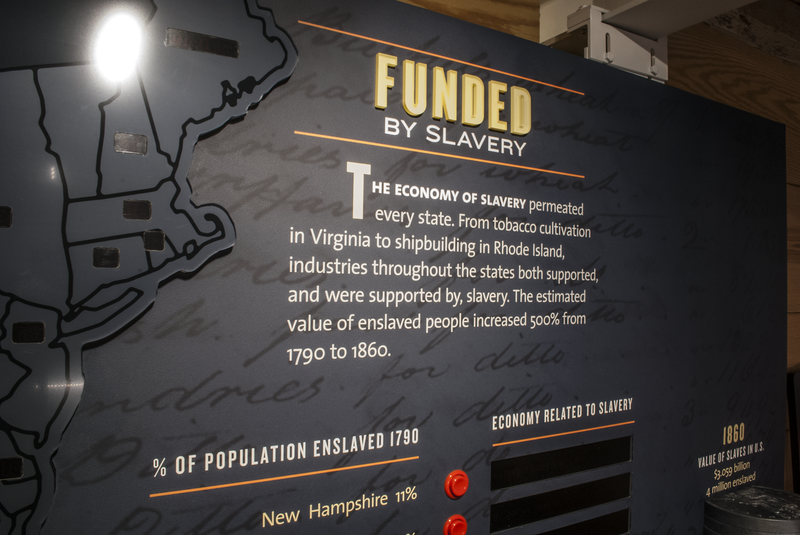 Visitors will also see Montpelier’s connection to the national story of slavery – and discover the economic, ideological, and political factors that cemented it in the newly-created American nation and Constitution. Drawing on historic letters and documents, the exhibition utilizes both artwork and artifacts to evoke the experiences of the enslaved. 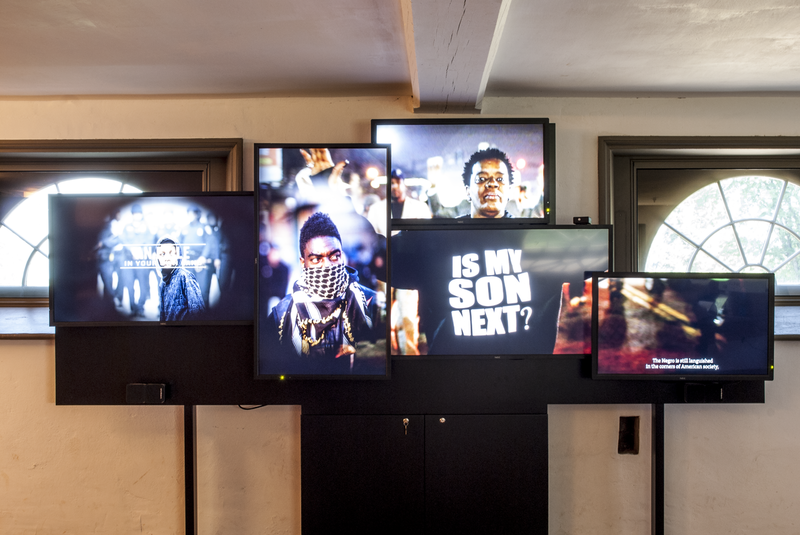 The messy and bipolar power of place is not lost in this emotional exhibition that confronts visitors with a historic site that is simultaneously a place where ideas of Liberty were conceived and, depending on “a mere distinction of colour,” a place where the same ideas were systematically denied. The North Cellar focuses on the national story of slavery, and the importance of the institution to the bourgeoning American economy. 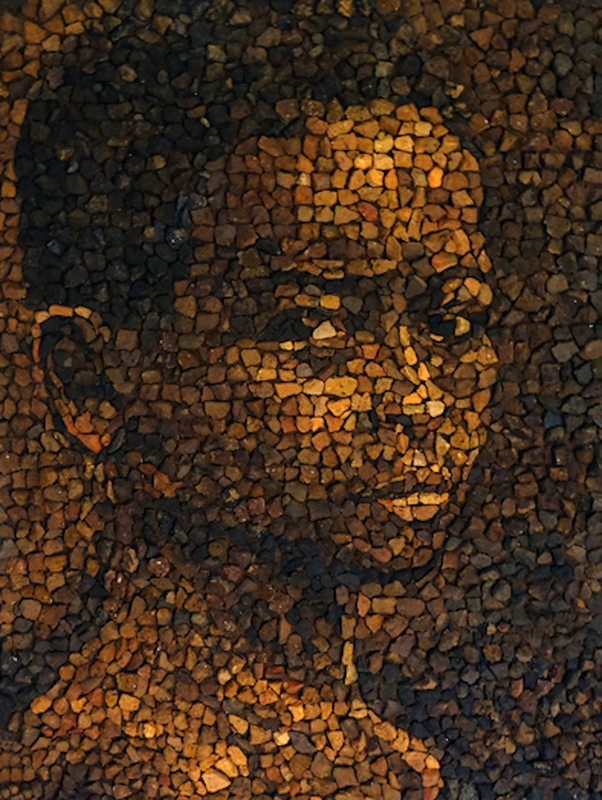 Though slavery is often thought to be a uniquely southern phenomenon, the reality is that each and every colony was in some way involved in keeping the slave trade alive and booming. This section of the exhibition also discusses the variety of opinions well-known people of the time had about the institution of slavery. One of the biggest debates around slavery is that of economics versus morality, with America's founders spanning both sides. This section of the exhibition discuss how slavery was codified in America's founding document. How many times is the word "slavery" explicitly mentioned in the Constitution? Although the words "slavery" and "slave" are never explicitly mentioned, there are 5 areas in the Constitution that discuss and protect the institution of slavery. This room has the entire text of the constitution displayed, and gives visitors the opportunity to interact with pieces of the document. Pressing a button on the Constitution panel lights up the corresponding decoder panel, further explaining how the passage relates to, and ultimately protected, slavery in the United States. 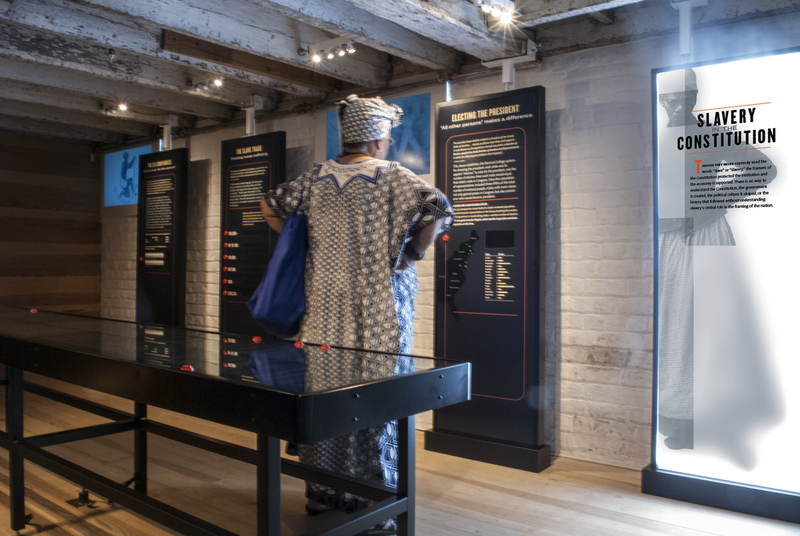 The final room of the north cellar addresses slavery's lasting legacies in modern society. One of the biggest critiques from our descendant advisors was that we "can't leave slavery in the past." Based on this feedback, we created a 10 minute video, connecting the history of slavery to many of the racial and cultural issue we still contend with today. In the south cellar we tackle the local story of slavery and explain how Montpelier and the surrounding area fit into the larger narrative. 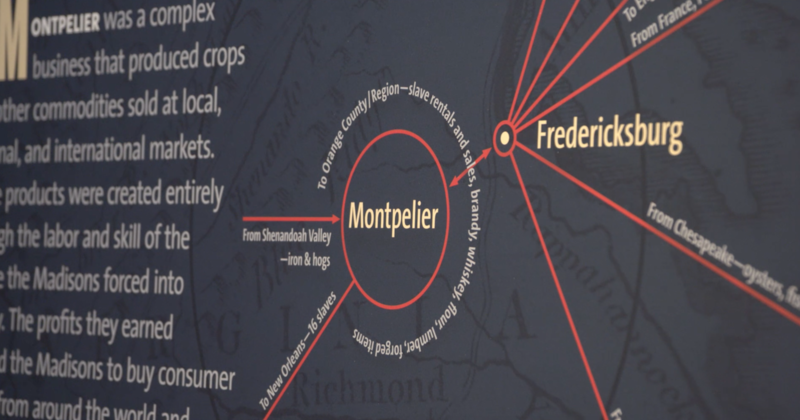 Through interactive panels and the voices of the descendants we talk specifically about Montpelier, those who were enslaved here, and their stories of their strength and resilience. Across the hall we aim to illuminate the humanity of those enslaved at Montpelier. Slavery is often talked about in terms of labor, the slaves themselves conceptualized as a monolithic labor force that becomes hard to relate to. None of us will be able to understand what it was like to plow a field, however, we can relate to the feeling of losing a loved one, or being separated from family and friends. The panels ascribe a variety of relatable human traits to enslaved individuals, before finishing with the common refrain "I was property." A major theme throughout The Mere Distinction of Colour is debunking commonly-held myths about slavery. Through our extensive archaeological work, we are able to get a better understanding of the day-to-day lives of enslaved individuals. Everything slaves had was given to them. Archaeology indicates that slaves cultivated rich social lives and purchased items from local markets. Fragments of personal items, like dolls and ceramic dishware, were excavated from Montpelier's South Yard. The final 2 rooms of the cellars rely on primary sources that make slavery personal. In one room, you can see a slideshow of documents showing the buying and selling of slaves, and the discussion of people as currency. In the next room is the story of Ellen Stewart, a young woman born into slavery at Montpelier, who, throughout her life is forced to bear witness to the destruction of her family. All of her immediate family members are either sold away from Montpelier to cover debts, or passed away before she was 15 years old. The reconstructed South Yard is where those enslaved at Montpelier would have lived and worked. It is made up of two double-quarters, a building that was used as a kitchen, and one used as a smokehouse. These buildings have been rebuilt to look as they would have during the Madison-era, their accuracy based on extensive archaeology and intact insurance maps from the period. 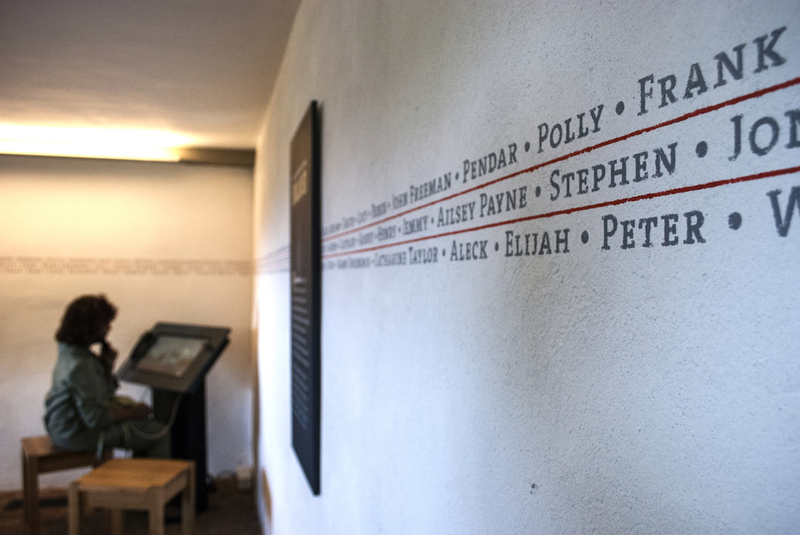 Each of the outbuildings contain exhibition elements with the voices of one of the members of our descendant community retelling an oral history. Engagement with the Montpelier Descendants Community takes on many forms, from archaeological programs, to gatherings and celebrations, to advising on, and participating in, The Mere Distinction of Colour. Montpelier intentionally employs a broader definition of "descendant." 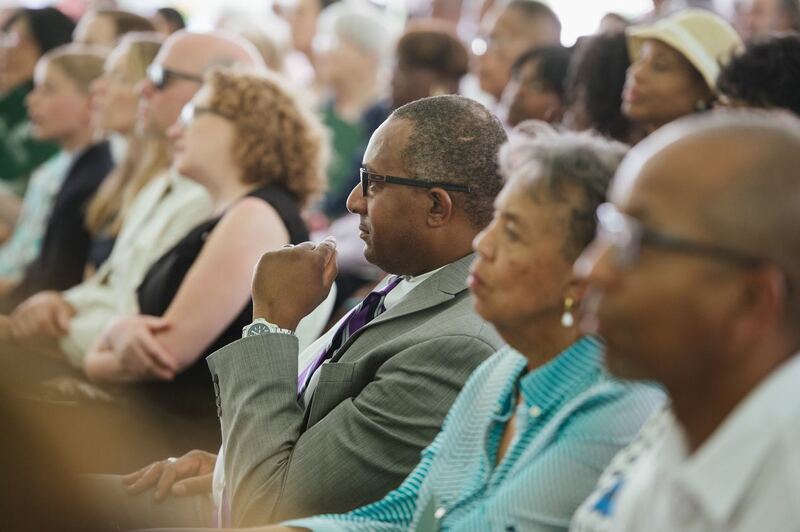 While other historic sites require DNA evidence, the Montpelier Descendants' Community is an active and growing group of African Americans who have traced their lineage back to Montpelier or the greater Orange County area via documentary record or oral history. The result is a broad stakeholder group, some with documented ancestral ties, and others who feel a connection to, and ownership of, this history of Montpelier and it's affect on the history of our nation. Since opening on June 4, 2017, The Mere Distinction of Colour has opened doors to broader conversations about race, rights, and history with local community members, educators, and constitutional practitioners. Slavery is a part of our American DNA. It's imperative that historic sites embrace a more holistic view of American history, even the messy parts, in pursuit of the "exceptional" version of America we all strive to be a part of. "This isn't African American history, it's American history." The Mere Distinction of Colour was made possible by a $10M pledge by patriotic philanthropist, David Rubenstein, to be used for restoration of the house and to complete the construction of the South Yard. With this generous gift, Montpelier has been able to restore the landscape to a more accurate representation of the Madison-era and also install The Mere Distinction of Colour exhibition.